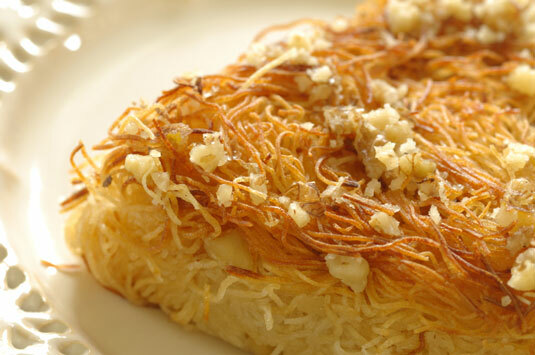 Finely shredded pieces of phyllo dough, or kataifi, are a favorite Greek and Middle Eastern ingredient to use in making baklava-like pastries. When baked, it crisps up and closely resembles shredded wheat, which makes for an ideal and readily available substitute for phyllo and which is what you use in this recipe. Prepare the syrup by combining the 1-1⁄2 cups sugar, water, and honey in a small saucepan. Bring to a boil over medium-high heat. Add the lemon peel, cinnamon stick, and cloves. Lower the heat to a simmer and cook, covered, for 20 minutes. Remove from the heat and let cool to room temperature. Add the lemon juice. Pour through a fine mesh strainer before using. Preheat the oven to 375 degrees F. Generously butter a 9-x-13-inch baking dish with some of the melted butter. Quickly dip half of the shredded wheat, one at a time, into the lukewarm milk. Let the excess milk drip back into the bowl. Break the softened shredded wheat in half horizontally and cover the bottom of the prepared pan. Combine the walnuts, 1 tablespoon sugar, and cinnamon in a bowl and sprinkle on top of the shredded wheat. Place the remaining shredded wheat, dipped in the milk and split in half, over the nut mixture. Spoon the melted butter evenly over the top. Bake on the middle oven rack for 7 minutes. Remove from the heat and cover with foil. Let cool until lukewarm. When the shredded wheat is lukewarm, spoon the syrup over the pastry. Re-cover with foil and cool to room temperature. 9Cut with a sharp knife into 24 pieces.